Sandwiched between a cookie and a cake, bar cookies are some of the quickest and easiest cookies to make. Dough and other ingredients that are poured or pressed into the pan with sides (instead of on a baking sheet), sometimes in multiple layers. After baking and cooling, they are cut into shapes such as squares, rectangles, triangles, or diamonds. They can be crisp or chewy; filled or layered; smooth-surfaced or crumbly on top. 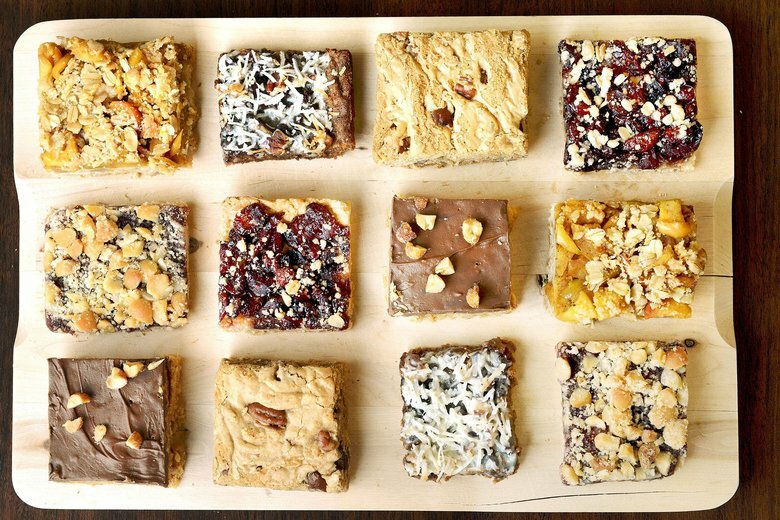 Well-known types of bar cookies are brownies, blondies, and lemon bars. Multiple- layer bar recipes may call for a crust that is partially baked first, then topped with filling or another layer and returned to the oven for additional baking. This approach prevents the crust from becoming soggy and undercooked. Bar cookie recipes typically call common baking pan sizes. Texture is affected by the thickness of the dough. For instance, if the pan is too large the dough may dry out and the bars will be too thin. If you use a pan smaller than called for in the recipe, the bars may become gummy in the center or cakier than they should be. Use the size of the pan called for in the recipe. Use vegetable shortening, nonstick vegetable spray, or unsalted butter or margarine to grease baking sheets and pans. Salted butter may cause bar cookies to stick and over brown on the bottom. Or you may choose to line the baking pan with heavy duty aluminum foil or parchment paper to ensure easier removal later. An easy way to shape the liner to the pan is to turn the pan upside down, smooth the foil or parchment paper around its contours to fit, flip the pan over, and set the formed liner inside the pan. Make sure the liner extends a couple of inches over the ends of the pan as an overhang to use as handles for when you remove cookies. Do not over beat bar cookie dough. Beat just enough to mix the ingredients together. Gluten molecules in flour are activated when flour is moistened. Too much handling can cause the gluten in the flour to expand in excess, allowing the dough to rise too much. The dough will then fall when baked, leading to a cracked surface and a ridge around the outside edges – or harden too much when baked, producing tough bar cookies. Spread the dough and other ingredients evenly in the pan. A bumpy spread means one part of the pan of cookies will bake faster than the other, leading to uneven doneness. If you’re using a glass baking pan instead of a metal pan, reduce the oven temperature by 25°F (10°C). Glass transfers heat more easily than metal. Allow for fluctuations in oven temperatures by checking your bar cookies at least a couple minutes before the minimum baking time suggested to see if they’re done and to avoid over-baking. Watch for sides shrink from the sides of the pan or the top springs back when lightly touched with your finger. You can also tell if bar cookies are done when a wooden pick inserted in the center comes out clean. Watch carefully toward the end of the baking time. Over baked bars will be dry and hard. Bars that may seen underdone in the center will firm up when cooling. Bars continue to “bake” after being removed from the oven, as the internal temperature stays above room temperature during cooling. Follow the recipe directions as to when to cut bars. Some crisp-style bars, such as shortbread, must be cut while warm to prevent crumbling around the edges. All other bars can be scored with a sharp knife as soon as the pan comes out of the oven while in the pan. Use a sharp knife to score and cut the bars. To cut perfectly sized bars, position a clean ruler on top of the bars and make cut marks with the tip of a knife. Use the ruler as a cutting guide. Once cooled, cut along scored lines. If you’ve lined the pan with foil or parchment paper, lift the bars to a cutting board, remove the liner, and cut the bars. To make even cleaner edges, dip the knife in hot water and wipe with a dry kitchen towel before making each cut. You might also use a large sharp chef's knife to trim away the outer dry edges of the bars before cutting them, wiping the blade clean with a damp towel after each cut. The best way to store bars is to leave them in the pan after baking and cover the pan tightly with plastic wrap or aluminum foil. Many baking pans have lids, too.